COMPACT & VERSATILE multi purpose tool at your finger tips with easy carry belt sheath. CORROSION RESISTANT anodized aluminium handles profiled for grip and stainless steel tools. 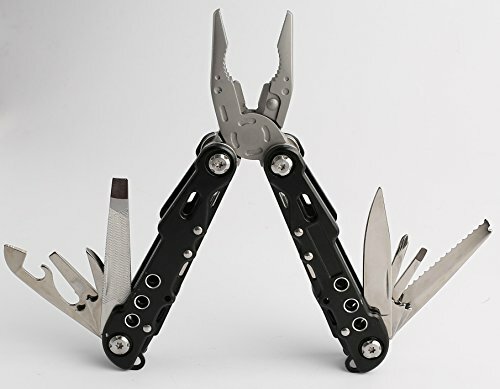 SAFETY LOCKING MECHANISM prevents snap closing on fingers, only buy tools with blade locking. ROBUST and DURABLE internal spring loaded pliers for easy use, avoid external spring which breaks. 100% Guarantee we promise a full refund or replacement tool if you are not satisfied in any way.